Alison R. Byerly ’83 has been named the 17th president of Lafayette College. Byerly will take office on July 1, 2013, as the first woman president of the residential liberal arts college in Easton, Pa., that was founded in 1826. In an announcement released today by Lafayette College, Chair of Lafayette’s Board of Trustees Edward W. Ahart said Byerly is a “visionary leader” with “a deep understanding of the challenges and opportunities for undergraduate colleges now and in the future.” The appointment caps a six-month international search. A native of Glenside, Pa., Byerly earned a bachelor of arts degree with honors in English from Wellesley in 1983. As an undergraduate, she received the College’s Jacqueline Award in English Composition and Mary C. Lyons Prize in Writing. She continued her studies at the University of Pennsylvania, where she earned a master of arts in English and a doctorate in English. Byerly went onto serve in leadership positions at Middlebury College for 13 years, most recently as provost and executive vice president. 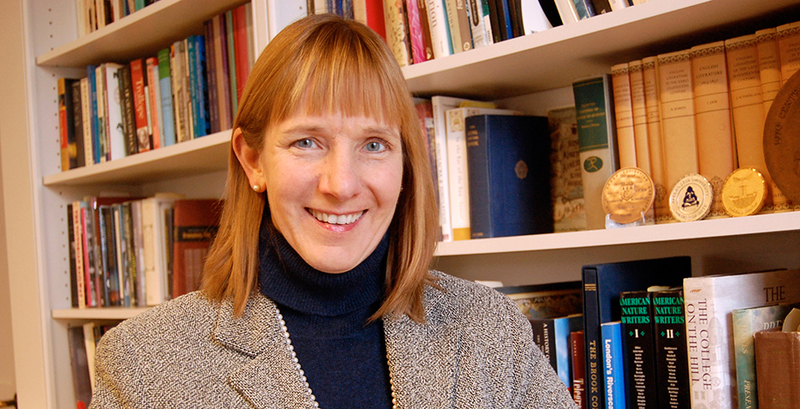 A member of the Middlebury faculty since 1989, she holds an interdisciplinary appointment as college professor and has been a visiting scholar at the Massachusetts Institute of Technology, Stanford University, and Oxford University. She is the author of two books, Are We There Yet? Virtual Travel and Victorian Realism, published in 2012 by the University of Michigan Press, and Realism, Representation, and the Arts in Nineteenth-Century Literature, published by Cambridge University Press in 1997 and reissued in paperback in 2006. With the appointment, Byerly joins the ranks of Wellesley alumnae selected to lead institutions of higher education: Donna Carroll '76, president of Dominican University; Alecia DeCoudreaux ’76, president of Mills College; Kay Norton '73, president of the University of of Northern Colorado; Frances Daly Fergusson '65, former president of Vassar College; and Nannerl Overholser Keohane ’61, former president of Duke University. Keohane also served as president at Wellesley College, as did these estimable alumnae: Diana Chapman Walsh '66, Margaret Clapp '30, and Ellen Fitz Pendleton 1886.